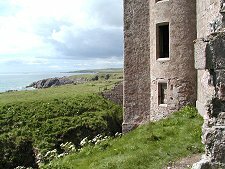 Slains Castle is a large imposing ruin fronting directly onto south facing cliffs about a kilometer east of Cruden Bay. You can walk to it from the village itself, or from the slightly nearer car park at a bend on the A975 at Grid Reference 103369. 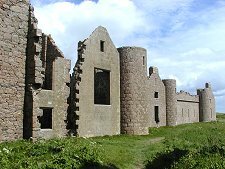 At some point the images on this page could become of historical interest only because in November 2004 Aberdeenshire Council gave outline consent for the restoration of Slains Castle and its conversion into 35 holiday apartments. Various complications remained, but in September 2006 the Council decided in favour of the development. 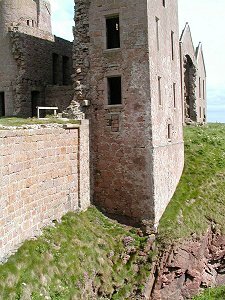 It was reported in October 2007 that Slains Castle had been fenced off prior to work beginning. The remainder of this page refers to the position prior to that happening. Whichever approach you pick, you will find yourself completely unaided by any signposts. We suspect this is because no one wants to be held responsible if you fall over the cliffs that lie immediately in front of the ruins, or if part of the building falls on you. 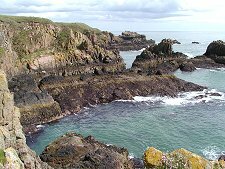 In that same spirit we should emphasise that Slains Castle could easily be a dangerous place: and if you do go, take great care. There are, confusingly, two Slains Castles on this stretch of coast. The original lay a mile north east of Collieston and about six miles south west of its successor. This was built in the 1200s as a fortress. But in 1594 the owner, the Earl of Erroll backed a plot by the Earl of Huntly against King James VI. 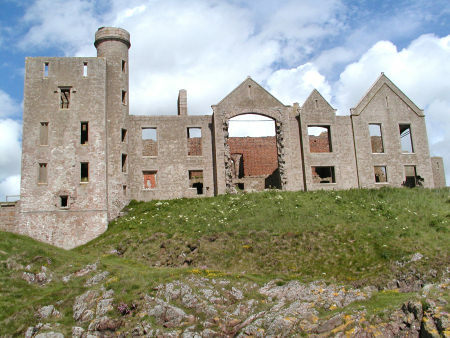 James responded by blowing up Old Slains Castle, and not much remains today. The Earl of Erroll returned from exile in 1597 and made his peace with James. 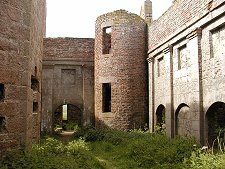 Rather than try to rebuild Slains, he instead used a tower house at Bowness as the basis for a new Slains Castle. The tower was extended and ranges of buildings were added around a courtyard. In 1664 the castle was again expanded and altered, and a corridor was built across the courtyard. The final major change came in 1836 when further wings were added and the underlying castle was given a granite facing and generally Disneyfied. 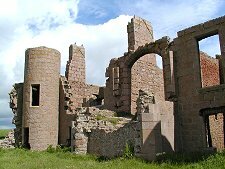 Building costs and high living did little for the family finances and in 1916 death duties forced the 20th Earl of Erroll to sell Slains Castle. The new owner allowed the castle to fall into disrepair, and in 1925 its roof was removed and valuable dressed stone removed for re-use elsewhere. Slains Castle today is a slightly unsettling place. It comes as little surprise to discover that Bram Stoker, who stayed at the castle, used it as inspiration for his story of Dracula. Earlier distinguished visitors included Samuel Johnson and James Boswell on their tour of the Highlands and Islands. You can read Johnson's description here, and Boswell's here. And they still do: the front of the castle lies literally along the edge of the cliffs, while its rear, beyond what were once its gardens, is protected from unwanted guests by a deep cleft that cuts into the cliffs as far as the main access road. 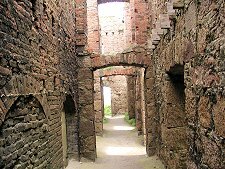 Internally, the castle is a collection of mostly brick-built intersecting corridors wrapped around rooms now deeply carpeted in nettles. In the heart of the castle is the courtyard, though it takes some time to work out which were outside areas in the original design and which were inside. Slain's general air of creepiness is not helped by the vaulted room accessed down a muddy slide that was probably once a kitchen store complete with large stone storage bins all the way around the walls. Unless (as you begin to wonder as you peer round in the near total darkness) it was some sort of crypt. 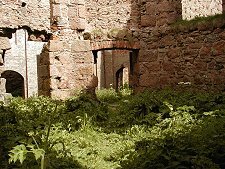 Most castle ruins in Scotland are well cared for, often by Historic Environment Scotland. Most are carefully maintained as ruins and come complete with interpretation boards, mown grass, and consolidated walls. 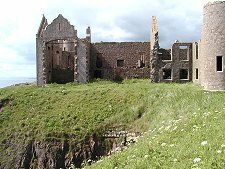 Slains Castle is distinctly different. You'd be hard pressed to call it attractive, even on the brightest of days, but is is most certainly interesting. This is what happens to ruins when nature has just been left to get on with it.